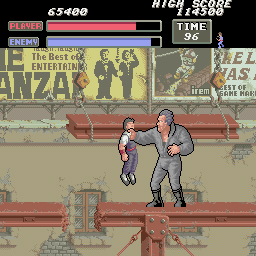 I couldn’t do a review of Kung Fu Master without immediately going onto its bigger, harder, tougher brother. 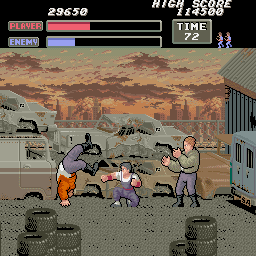 Whilst the Kung Fu Master was certainly a tough cookie, with deadly speed and accuracy, the nameless Vigilante of this game is a street-smart, muscle-bound hero who looks more than a little rough around the edges compared to the clean-cut & honourable Thomas. OK, look, there’s no reason to be cruel or kind about this, but brutally honest. It’s the bleedin’ same. Save for the updated visuals, enemies requiring more hits and the addition of a pair of flails (or nunchuckas, whichever you prefer) which you can pick up and use(as far as I can make out you get a little bit more range and approximately 50% more power with them), this is so close to being Kung Fu Master it’s not even funny. But then again, why should it be? KFM was a great game with a winning formula… in the 80s. Bringing the theme up to date doesn’t change the core game. 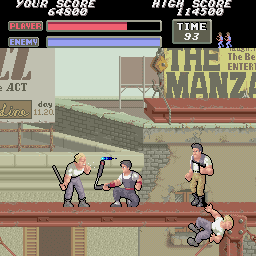 Your enemies fall from the pavement as if knocked off a ledge, just like KFM. The bulk of enemies just come up to you and “grip” you to drain your energy, just like KFM. And the challenge is… actually, it’s not as hard. Picking up the flails makes life much easier, especially the bosses (if you manage to hold onto them that long). Other subtle differences are present, for example, when you lose a life you carry on from where you were rather than returning to the start of the level. You can continue from the level you’re on when you lose all your lives. 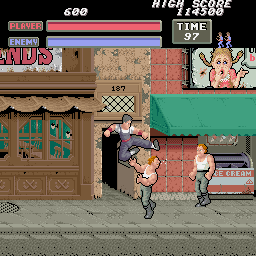 Flying kicks bounce you off enemies rather than driving through them. 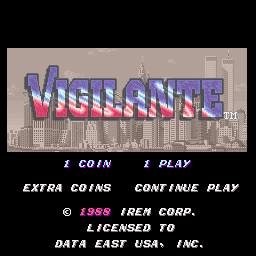 Vigilante isn’t a bad game, by any stretch of the imagination. 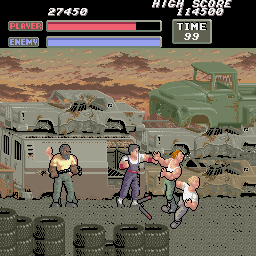 But unfortunately the updated visuals don’t separate this game from it’s older brother. Truth be told, if you play them both, you’ll play Kung Fu Master more. Well, I did.